Two more great Shadow Novels from the past! I am going to assume that anyone that is likely to read this review knows the Shadow’s back-story. The really great think about the Shadow novels is that the back-story isn’t repeated over and over ad infinitum throughout the series, unlike other pulp heroes. To make it short the Shadow is a man of mystery. He is always garbed in flowing black cape and slouch hat, only his burning eyes and beak-like nose visible. He is the Master of Darkness, able to camouflage himself in the shadows so as to be virtually invisible. He is also a Master of Disguise, which is why fans of the radio show rather than the pulps will be surprised at his identity. You see Lamont Cranston is the Shadow, but the Shadow is not Lamont Cranston! The true name of the Shadow is not revealed until issue 131 The Shadow Unmasks. And yet at times, even this identity is questionable. Perhaps the Shadow, like the Joker, prefers his life to be multiple choice! 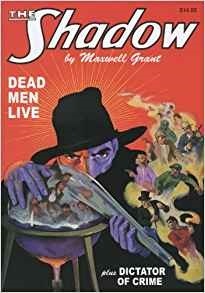 Dead Men Live, novel number 18 was originally published on November 15, 1932. I liked the fact that this features Shadow operative, Cliff Marsland. Behind Harry Vincent, Marsland is a favorite of mine! This was a great novel starring Kent Allard and Margo Lane! Yes! The book is published as a double-reprint, including the original interior art! Almost all of the 300 plus adventures of the Shadow would always be five stars plus to me!